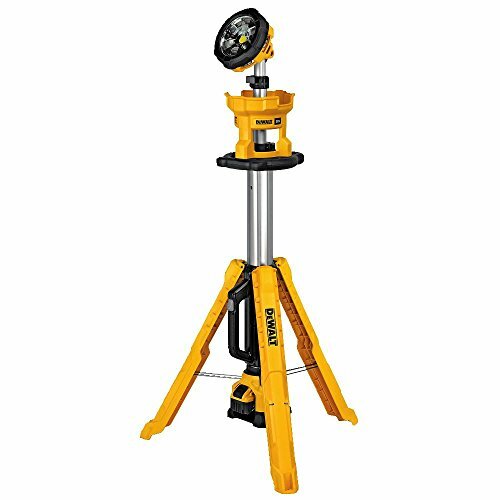 The DEWALT DCL079R1 20V max* cordless tripod light (kit) is built to light your workspace in the toughest jobsite conditions, with incredible durability in use, storage, or transport. Eliminate the hazardous heat of Halogen with cutting edge LED technology that provides extended run time and Natural white light. Variable brightness settings include 3000 lumens on high mode and let you customize illumination for your work area. Compact design with carry handle provides easy portability, and sets up in mere seconds. Rotating, pivoting head directs light where you need it. Lumens 1, 001-5, 000. Backed by DEWALT'S 3 year limited warranty. Kit includes: 1) tripod light, 1) DCB206 20V max* 6Ah battery pack, 1) DCB115 20V max* charger..